Live double album released after the bands official dissolution. The recordings featured are gathered from the bands last years - the first half being compiled from their (at the time) final world tour in 1997, the second being a recording from a single show ascribed to Norway in 1995, although precise details appear lost to time. 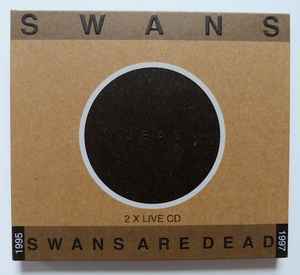 Initially released as an embossed digipak, but has seen continuous reissues in jewel-case format. The liner notes claim that Disc one (Black) was recorded in Amsterdam, New York City, Trondheim, Prague, Brussels and Atlanta in 1997 but this is not completely true. All songs besides "Blood on yr Hands" come from the show at the Paradiso, Amsterdam, March 13, 1997. "The Man With the Silver Tongue" was also perfomed in Amsterdam but was omitted from the cd (the original sounboard recording of the Amsterdan show is available at www.swans.pair.com - cd 054a). During the 1997 another song "My Birth" was played quite often but was also omitted from the cd.